Your brain works a lot like your email messages; some things go into your inbox, and some go into the spam folder. For your quality of life and even your sanity you need to manage which messages go where! Your email inbox represents all the incoming messages, while your spam folder is the junk mail, useless and annoying messages you get on a daily basis that you do not want. Often your inbox is overrun with messages, including spam that was not caught by the spam filter. Your spam folder contains the useless messages. Some of us dread checking our email simply because there are so many messages in there. Though it may sound like a strange notion, these two email boxes have an alarming similarity to your brain and the messages you receive there. Your brain is the ultimate inbox. Think about your brain in terms of having an “inbox” and a “spam folder”. All of the messages you receive including communication from others, thoughts, self-talk, etc. come into your inbox. Often they sit there and we keep looking at them, even though many of them are worthless spam. Your spam messages are those that are not worth your thoughts or emotions. They represent things that you may not be able to change, or things that you tend to worry over. It is easy to fail to send them to the spam folder in our brain. 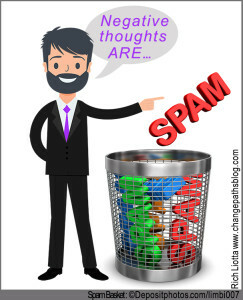 Spam messages in our brain are those that cause worry, regret, anxiety, poor self-esteem and other negative thoughts that serve no positive purpose. A completely full inbox with tons of spam is overwhelming and frustrating. Managing these messages appropriately can improve mental wellbeing, lessen anxiety, and lead to greater life satisfaction. Your inbox is best reserved for positive messages, things you really do need to attend to, and matters that require your energy and consideration. It is not for all those negative thoughts – the spam. How do you manage your inbox and your spam? Managing your incoming messages can be really challenging and takes some practice. Once you get really good at it, your spam messages (those worthless messages) will automatically go into the spam box like they often do in email. Your email spam works by establishing rules around what you deem to be spam. Every time you send an email to spam your email provider recognizes that, creates a rule, and begins to send all similar emails on to spam. Establishing rules for your brain’s inbox is how to begin managing it. The first step in learning how to manage your brain’s inbox is establishing what spam messages look like for you. If you are a worrier, you may establish a rule that messages that cause worry will automatically go into the spam folder. Or if you have poor self-esteem you might establish a rule that negative self-talk and negative self-image messages automatically go to the spam folder. If you take time evaluating your thoughts and your reactions to them, you will quickly learn what thoughts are trigger buttons for you, potentially causing anxiety and worry. Those are the messages to get rid of. When you figure out what your spam messages look like, you must then make a conscious effort to send them to the spam folder. This means that as you receive a spam message you say to yourself, “This is spam, I can briefly review it to see if it contains anything useful, and then disregard it without getting emotionally involved.” Spam typically represents things that you cannot control. Sending the messages to your spam folder is the action of accepting what you cannot change, and then moving on. This allows you to make room in your brain (your inbox) for messages that are important, useful to you, and worth your energy. Why is cleaning out your inbox beneficial to your well-being? Consider all of the things that go through your mind on a daily basis. How many of them are valuable and important thoughts? And how many of them are worthless thoughts, causing you worry and pain? How do you think you would feel if you were able to eliminate those negative thoughts, only focusing on the positive thoughts needed to get through the day? You would surely feel a whole lot better! Focusing on the important thoughts and ignoring those that drain you emotionally and mentally are a great steps in the direction of mental peace and life satisfaction. You are able to accept what you are unable to change, spend little time trying to change it, and move on more quickly than you ever believed possible. Imagine how wonderful it will be to delete the spam, rather than allowing it to overflow into your inbox, invading your thoughts and your life. YOU are in control, and when you are ready YOU CAN get rid of that spam by making use of your brain’s spam folder. This entry was posted in Abundance, Mind, Negative thoughts-Positive thoughts and tagged Happiness, mental health, negative thoughts, personal development, positive thoughts, self-improvement, success. Bookmark the permalink.